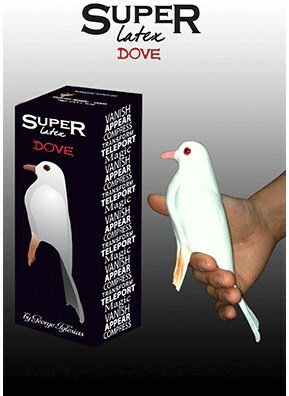 Made out of our new and patented material Super Latex this dove looks very real and have been specially manufactured taking care of all the small details, such as the size and shape of a real dove including great level of realism with the eyes, nose and legs. This is a great prop for Stage and Parlor Magicians, Comedians, Presenters, Entertainers, MCs and Clowns. Multiple effects can be accomplished such as making a dove vanish in your hands, inside of a handkerchief, making a real dove teleport from one side to the other, appear it inside of a bird cage and many many more! A classic prop in Magic brought to a great level of realism! This is as good as it gets!